Greene County is a county located in the U.S. state of Mississippi. As of the 2010 census, the population was 14,400. 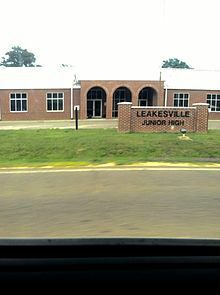 Its county seat is Leakesville. The county was established in 1811 and is named for General Nathanael Greene. According to the U.S. Census Bureau, the county has a total area of 719 square miles (1,860 km2), of which 713 square miles (1,850 km2) is land and 5.9 square miles (15 km2) (0.8%) is water. As of the census of 2000, there were 13,299 people, 4,148 households, and 3,152 families residing in the county. The population density was 19 people per square mile (7/km²). There were 4,947 housing units at an average density of 7 per square mile (3/km²). The racial makeup of the county was 72.79% White, 26.18% Black or African American, 0.23% Native American, 0.07% Asian, 0.03% Pacific Islander, 0.31% from other races, and 0.38% from two or more races. 0.80% of the population were Hispanic or Latino of any race. There were 4,148 households out of which 37.20% had children under the age of 18 living with them, 61.20% were married couples living together, 11.90% had a female householder with no husband present, and 24.00% were non-families. 22.00% of all households were made up of individuals and 9.30% had someone living alone who was 65 years of age or older. The average household size was 2.67 and the average family size was 3.12. In the county, the population was spread out with 24.10% under the age of 18, 13.10% from 18 to 24, 32.10% from 25 to 44, 20.60% from 45 to 64, and 10.10% who were 65 years of age or older. The median age was 32 years. For every 100 females there were 130.00 males. For every 100 females age 18 and over, there were 141.00 males. The median income for a household in the county was $28,336, and the median income for a family was $33,037. Males had a median income of $30,189 versus $17,935 for females. The per capita income for the county was $11,868. About 16.50% of families and 19.60% of the population were below the poverty line, including 25.30% of those under age 18 and 21.10% of those age 65 or over. The Mississippi Department of Corrections South Mississippi Correctional Institution is located in an unincorporated area of Greene County. It opened in 1990; in the 21st century, it has an inmate population of more than 3,000 men, which has added markedly to the total population of the county. Its inmates constitute approximately 21 percent of the state's total prisoners. The facility provides employment to numerous residents of the county. The Greene County School District includes: Greene County High School, Greene County Vocational-Technical School, Leakesville Elementary School, Leakesville Junior High School, McLain Attendance Center, and Sand Hill Attendance Center. ^ a b "State & County QuickFacts". United States Census Bureau. Archived from the original on July 11, 2011. Retrieved September 3, 2013. ^ Bureau, U.S. Census. "American FactFinder - Results". factfinder.census.gov. Retrieved 2018-03-03. ^ "State Prisons Archived 2002-12-06 at the Wayback Machine." Mississippi Department of Corrections. Retrieved on May 21, 2010. ^ "MDOC QUICK REFERENCE." Mississippi Department of Corrections. Retrieved on May 21, 2010. ^ "Greene County School District". www.greene.k12.ms.us. Retrieved 2018-03-03. This page was last edited on 13 October 2018, at 02:49 (UTC).